This Condo has a great vibe on the inside! 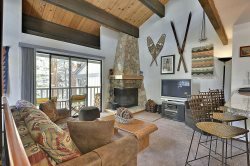 With cool rustic decor themed around skiing and the Lake, this unit is ideal for a family of four or two couples who want to explore Lake Tahoe. Upon entry to the first floor, you will find a full bath and a bedroom with queen size bed. A sliding glass door opens to a private balcony. Ascending the first flight of stairs to the second level is the open living room, kitchen and dining. This design offers a great environment for gathering. There is an entertainment center with TV (basic cable included), VCR, DVD, and CD players. The fireplace has recently been rebuilt, featuring an oak mantle and river rock facing for that authentic Tahoe feel. There is a covered deck just off the living area, that overlooks the greenbelt and creek behind the condo. The kitchen has been completely remodeled and features oak fronted cabinets and granite counters. New appliances include electric oven with ceramic cook-top, dishwasher, microwave, and refrigerator. Small appliances include toaster, mixer, and coffee maker. The kitchen is very well equipped with pots, pans, utensils, dishes, and is stocked with basic pantry items. The second flight of stairs lead to the Loft and two new twin beds. The closet also contains games for the young and young at heart.